After last night's 36-point, 14-29 FG, 2-2 FT performance, that list is also home to J.R. Smith. In fact, he's on there twice. His name may not appear as many times in the top 100 as Kobe Bryant's (6) or Michael Jordan's (3) do, but he embodies the spirit of this list more so than they ever will. Whereas "volume shooter" only partly describes MJ and Kobe, it tells you everything you need to know about Smith. He is essentially what you'd get if you combined all the gunners on this list into one player and gave him free rein on the floor and 25 minutes of run. Heading into last night's Thunder-Knicks game, everyone knew that if a 'Melo-less New York was going to stand a chance against OKC, "good" J.R. Smith was going to have to show up in place of "bad" J.R. Smith. "Good" J.R. is the guy who can sink double-digit three-pointers and run the opposing team off the court by himself. 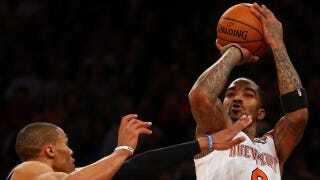 "Bad" J.R. is the guy who bricks six shots in a row and makes Knicks fans want to jam a fork in their eye. For the first three quarters of last night's game, "good" J.R. was in rare form. After nailing five three-pointers and a variety of pull-up and step-back jumpers, Smith headed into the fourth quarter with 31 points; his team led, 81-75. And then "bad" J.R. showed up and decided to shoot 2-9 from the field during the fourth quarter before missing the potential game-winner on an ugly isolation play. It's maddening to watch Smith transmogrify himself from a great player into a bad one so quickly, but it shouldn't be. Because what I realized last night is that there really is no difference between "bad" J.R. and "good" J.R. Compare him to OKC's point guard, Russell Westbrook, whose own Jekyll-and-Hyde issues have been discussed at length. You know what a good Westbrook performance is, and you know what a bad one is, too, and there's a clear line of demarcation between them. When things are good, he's attacking the rim, getting transition buckets, and not entirely forgetting that he has the most dynamic scorer in the league on his team, too. When things are bad, he's settling for too many of those cockeyed jump shots that seem to come spinning off the rim like a cue ball off the break. He's throwing up three-pointers and generally shooting when he should be passing. Those are clear, identifiable differences. Smith's game can't be so easily divided. The mechanics of his good games are the same as those of his bad ones. Both are defined by Smith shooting the ball. A lot. And from every spot in the arena, up to and including from behind the sneeze guard at Ainsworth Prime. The only difference between a good game and a bad game lies in whether or not those shots are falling. Watching Smith play isn't a lesson in right versus wrong so much as it is a lesson in basketball fate. He doesn't really control the outcome of his actions any more than a flipped coin can decide whether to land on heads or tails. He just shoots, like he's always done, and the rest is up to the gods. He's actually a comforting presence in the NBA, in his own way. You always know what you are going to get from him, even when you don't.